Following the life cycle of the salmon that run up the West Webburn we have just completed our Kelt protection. The adult salmon run up the river to spawn above us, I have mentioned our fish wheel in a previous news article, protecting them on the way up. On the way back down the river after spawning about 5% will live to get back to sea the remainder will die naturally. 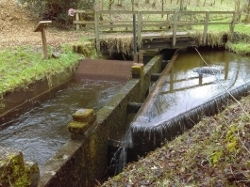 To help the 5% we have a static grid which stops the kelts entering our leat and therefore ensures they travel past our system by swimming over the weir to continue their journey to the River Dart and eventually Dartmouth. This year we were actually able to show a visiting group how it works – not many folk choose to visit in cold, wet, windy January!